President Barack Obama and leading Republican presidential candidates have called for increasing defense spending. However, given the opportunity to make their own defense budget, a majority of voters (61 percent) cut defense spending in a new in-depth Citizen Cabinet survey. Not even a majority of Republicans made increases. 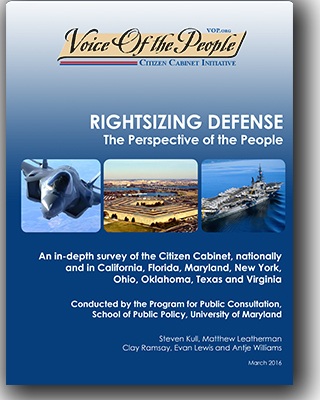 A report of the survey’s findings, “Rightsizing Defense: The Perspective of the People” was released today. In the survey, a representative sample of more than 7,000 registered voters across the country were first presented detailed, nonpartisan information and competing arguments about the current defense budget. The majority trimmed annual spending by $12 billion, including ground forces by $4 billion (or 3 percent), nuclear weapons by $3 billion (13 percent), air power by $2 billion (1.5 percent), naval forces by $2 billion (2 percent) and missile defense by $1 billion (13 percent). Special operations and the marines were left untouched. No areas were increased. A majority of Democrats cut $36 billion, independents $20 billion; while there was not majority support for either increases or decreases among Republicans. African American respondents cut the budget $34 billion; Hispanics cut $20 billion. In addition, 54 percent of respondents approved of cutting the F-35 program, saving $97 billion through 2037. Reducing the numbers of aircraft carriers from 11 to 10 was approved by six-in-ten, saving $7 billion over the next ten years. Well as a Social Independent and a strong proponent of the military, I guess I’m in the minority. However, I see the public reaction as a result of our political dissatisfaction rather than a result of our actual needs. We have entirely too much waste, and corruption in our procurement policies. The navy had to cut production of the LCS Class of Ships because of cost overruns. The Pentagon has publicly bungled the cost overruns of the F-35 in virtually all of its iterations, and even now there is talk of problems with the software in the existing fleet that was deemed ‘operational’ by the Marines. We have too many Generals and Admirals involved in the Pentagon, most of whom are preparing for the next phase of life, meaning working for the ‘Military Industrial Complex.’ It’s hard to piss off your future employer by blaming them for cost overruns. I do agree that we have too many aircraft carriers, frankly with the new technology already demonstrated by China, aircraft carriers are much to vulnerable and require a host of other ships both above and below the surface to attempt to protect them. What happens to the aircraft squadrons’ when the carrier is sunk, those in flight are forced to crash into the sea, those still in on the carrier go down with the ship. The public, and rightly so is dissatisfied with the obvious corruption, if a tank is built, (just an example, we have more tanks then we need) however the Republican controlled House, and the Democrats when they were the majority, forced the Pentagon to buy from contractors, which have set up shop or use sub-contractors in virtually as many Congressional Districts as possible; the cannon is made in one place, the radar is made in another place, the A//C yet in another and so on, so as many Representatives can claim to their constituents; look at all the jobs I have brought to ‘Podunk,’ meanwhile the cost has been increased exponentially.